Receive this free toolkit of 5 Strategic Planning frameworks. To receive these documents, complete the blue form on the right. You will need to invite 3 friends to this page. The following presentations are included in this toolkit. Digital Transformation is the hot topic these days! It is becoming critically important, as the role of technology shifts from being a business enabler to a business driver. 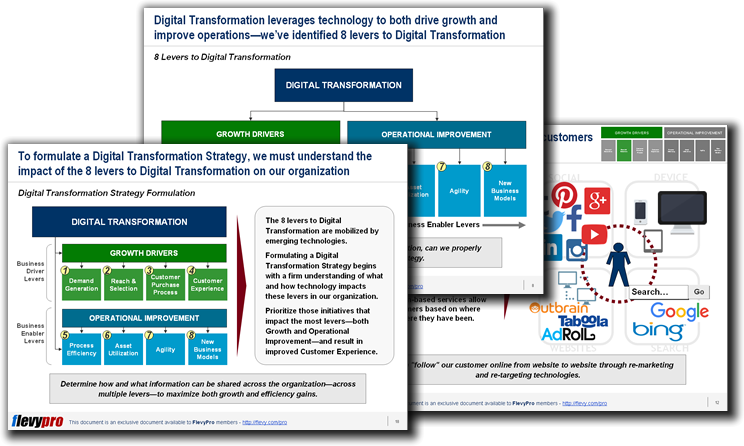 Transformation is driven by 6 Technology Trends, each of which should be carefully considered in your Strategic Planning. Many companies develop robust strategies, but struggle with operationalizing their strategies into implementable steps. This presentation introduces 12 powerful business frameworks spanning both Strategy Development and Strategy Execution. These are useful tools that should be leveraged in every Strategic Planning exercise. Proper Market and Customer Segmentation is crucial to your organization's success. It creates the foundation to a relevant Value Proposition and Go-to-Market Strategy. Performing this exercise incorrectly will lead to misinformed—potentially disastrous—strategic business decisions. The Customer Experience is evolving from a traditional linear process (with few touch points) to a continuous, circular process (with constant touch points). This new approach to Customer Experience has been captured by many top-tier management consulting firms, as it's at the core of Digital Growth Strategy. Lastly, we have included a real discussion deck template for a Strategic Planning session. In this presentation, we go through a 2-prong approach to growth and evaluate the merits of various growth drivers. To download, enter your info below and invite 3 friends to download this toolkit. Share this page with your friends and colleagues. Once 3 friends visit this page, we will send you our frameworks to your email (entered above).